Ever noticed the graceful lines and angles of a migrating flock? We have, and it inspired this Craftsman style bungalow. Gently sloping body topped with a hand-burnished copper roof and large hanging loop. Bronze nail heads detail the front. Copper cleanout door in back. 8" x 8" x 12" - 1-3/8" hole. Crafted by Heartwood - 100% American made! 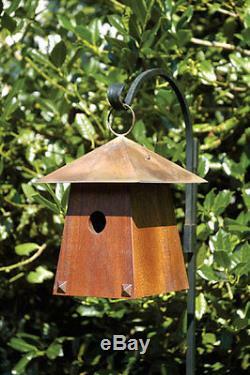 The item "Avian Bungalow Bird House by Heartwood cypress wood" is in sale since Thursday, November 10, 2011. This item is in the category "Home & Garden\Yard, Garden & Outdoor Living\Bird & Wildlife Accessories\Birdhouses". The seller is "gardenartisans" and is located in Annapolis, Maryland.